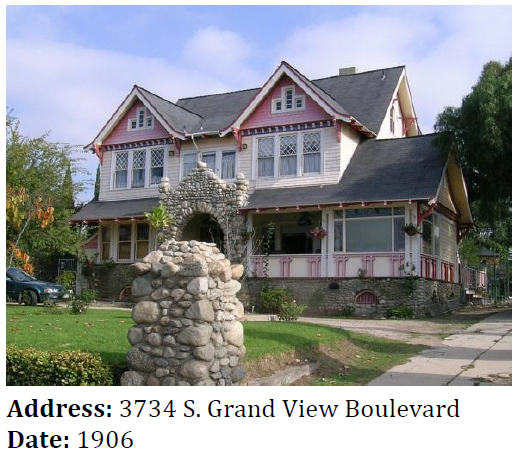 A remarkable Craftsman house with Queen Anne influences in Mar Vista. SurveyLA’s findings keep rolling in! This post takes a look at the report for the Palms – Mar Vista – Del Rey Community Plan Area. Here’s a map to get oriented. Since I last wrote a post for this blog we’ve also released four new reports for what we call Group 4, a set of areas in the south San Fernando Valley from North Hollywood to West Hills. This is pretty exciting for us since these are our first findings from the San Fernando Valley, and I’ll be taking a look at them in upcoming posts. All of this is up on our Survey Findings webpage. Please remember, we want to hear from you to get historic place suggestions and feedback on the reports. We’ve still only released 13 of 35 reports that SurveyLA will eventually produce, so there’s much more to come. Getting back to Palms – Mar Vista – Del Rey, our report is posted online in four parts: the Historic Resources Survey Report, a detailed section on Individual Resources, a section on Non-Parcel Resources (i.e. notable stuff that isn’t located inside of a parcel) and a section on Historic Districts, Planning Districts and Multi-Property Resources. Palms, Mar Vista and Del Rey were mainly agricultural during the eras of Spanish and Mexican sovereignty. The catalyst for urbanization was, as in so many other parts of Los Angeles, the arrival of transportation infrastructure. In this case, the 1875 arrival of the Los Angeles and Independence Railroad (later part of the Southern Pacific system). Palms took off by selling itself as a “half-way” point between Downtown Los Angeles and Santa Monica. Pacific Electric streetcars came too in the early years of the 20th Century. By 1915, Palms was annexed into the City of Los Angeles. Farther west, Mar Vista saw its first residential subdivisions in 1904. There were four main tracts, which were collectively known as Ocean Park Heights. Large areas stayed agricultural well into the mid 20th century. A huge boom of residential subdivisons happened in the early 1920s and by 1927 local voters seeking improved municipal services decided to support annexation into the City of Los Angeles. South of Palms and Mar Vista, Del Rey took off after Al Barnes’ Wild Animal Circus and Zoo relocated there from Venice around 1920. Barnes’ clout in the area irked some local residents, who managed to reduce it by incorporating the area as a city in 1926. Mere months after incorporating, newborn Barnes City attempted to consolidate into the City of Los Angeles. However, the attempt was thwarted for years by litigation. By 1928, Barnes had decided to move his operation to the San Gabriel Valley. Barnes City was consolidated into the City of Los Angeles in 1930. Few traces of the circus and zoo remain today. Other factors driving the area’s development were the industries that took root nearby. After 1924, oil drilling was a major presence. Hughes and Douglas opened aircraft manufacturing plans nearby in the 1930s. By World War II, workers were pouring in for defense jobs, and after the war, returning GIs provided the demand for a new wave of residential and commercial development. The Federal Housing Administration played a role too, as developments such as Westside Village (a planning district identified in SurveyLA’s findings) built modest, affordable houses to conform to FHA lending standards. Other post-WWII developments included an expansion in the aircraft industry, the completion of the nearby sections of the 405 freeway (by the early 1960s) and the growth of employment opportunities at MGM studios. I’ve picked out some of my favorite finds from the report below. You can click on a photo to start a slideshow. Special thanks to MyHistoricLA.org user “Christopher M1” for the great information on Palm Place (The Oval). Our survey teams had that with them in the field and described the area as a planning district. You can also read more about the Pico Boulevard Chili Bowl on MyHistoricLA.org. This Victorian Vernacular cottage is thought to be one of the oldest residences in Palms and has avoided significant alterations over the years. A Neoclassical fourplex in Palms. A programmatic building designed to look like a bowl of chili. More info at MyHistoricLA.org! This Middle School is a great example of Late Moderne architecture. We got a tip on this from MyHistoricLA.org! The Oval or Palm Place developed in fits over several decades. It has a street plan by Wilbur David Cook Jr. who also did an early design for Exposition Park. A Mid-Century Modern apartment building in the Barrington Multi-Family Residential Historic District. This American Colonial Revival commercial building is one of three that help create a sense of place at the intersection. This Corporate International style medical center uses a variety of cladding materials from glass curtain walls to glass blocks, to smooth stucco. I am here to bring you cheer...about LA's historic resources! This entry was posted in Uncategorized and tagged Del Rey, Mar Vista, MyHistoricLA MindMixer, Palms, SurveyLA Reports. Bookmark the permalink. Regarding the 11356 W. Nutmeg Avenue and its rejection as being the former residence of Al Barnes: The Los Angeles Times reported on 10-1-1961 the sale of 4225 Corinth Avenue. This address would have been just across the street from the Nutmeg residence. Per the Times the Corinth home …”was built many years ago by circus-owner Al G. Barnes, who used it as a private residence while he was here with his circus group”. The former site of the Corinth structure is now part of the DMV parking lot. The Times article shows a picture of the front porch of the home and describes it as having 8 rooms. Keep up the good work. Lots of interesting information is coming out of the Survey LA effort. Thanks very much! The house at 4225 Corinth Avenue definitely would have been interesting to document if it were still standing. 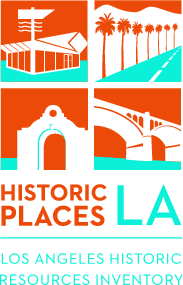 SurveyLA is the first-ever comprehensive program to identify significant historic resources throughout Los Angeles, a project of the City of Los Angeles Office of Historic Resources, with funding support from the J. Paul Getty Trust. This blog is a companion to the SurveyLA web site, providing a more informal chronicle of the project, whether from our office at City Hall or out in the field with the survey teams. Written primarily by SurveyLA volunteers and interns, the blog aims to capture the flavor of the city, as SurveyLA discovers Los Angeles' rich historic resources. As the survey progresses, this site will also provide a unique and broad-ranging view of the city's built environment and heritage, and a day-to-day record of one of the most ambitious local historic preservation survey projects in the nation.